While the Triple Crown of horse racing is still up for grabs (The Preakness, The Kentucky Derby and the upcoming Belmont Stakes on June 6), the three most notable red carpet events have already left the gate. You may have guessed that I'm referring to the Oscars, the Met Ball and the Cannes Film Festival. As a multi-day (11 to be exact) event in another country, Cannes is the most difficult to keep track of and to handicap. There were many winners and losers in this high fashion race however there's one particular gown that continues to haunt me like a ghost rider. 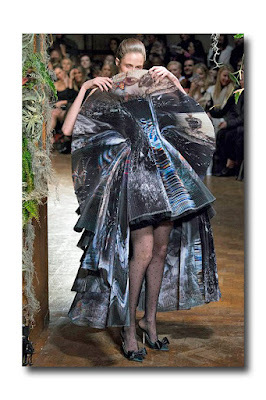 I had previously written about Britain's Giles Deacon and his amazing line, Giles in an article where I mentioned finding one of his dresses at a consignment store, spurring me on to learn more about him. A graduate of Central Saint Martins, he has been in business for ten years yet flies a bit under the radar as his label is somewhat elusive on this side of the pond. 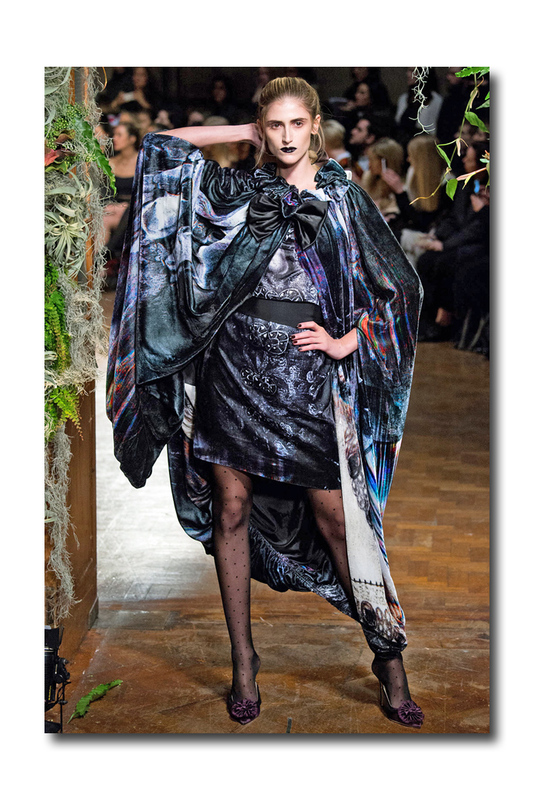 Giles's design references have been known to run the gamut from season to season and include inspirations as diverse as Pop Art, Goth, and Surrealism. Somehow he seems to make it all cohesive and intriguing, although I'd venture a guess that the collection inspired by Ms. Pacman probably reached a limited audience. One thing for sure: there's always an element of whimsy and surprise in his creations and they are never boring. Many gowns that were seen on the Cannes red carpet came directly off of various designer's runways with little or no modifications. Cate Blanchett's "mesmerizingly poufy, surreally printed Giles dress" (Vanessa Friedman's article, which she wore to the "Carol" premiere (an attention getting gown for an attention-getting film) initially gave me a moment of deja-vu. 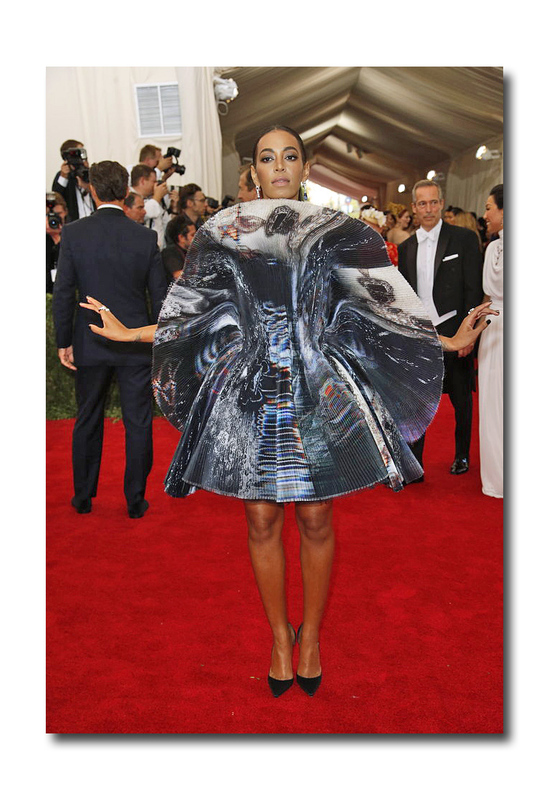 I finally realized it was because I had seen the fabric before via the accordion fan-like, face-obscuring mini dress that Solange had debuted at the Met Gala. Not surprisingly Giles employed the same dark but hypnotizing fabric for several items in his F/W 2015 collection. While Solange's dress was right off the runway, Cate's was custom created having no catwalk twin although there is a long full ballet skirt teamed with a black satin jacket which could be its cousin. My favorite iteration is the full-length cape which IMO, packs a punch and shows the showstopping fabric to its best advantage. Here at the end of May, summer's barely out of the barn, yet the retail animal likes to gallop ahead. While many seasonal offerings are already on sale, stores are urging us to pre-order (and pre-pay) for pre-fall. 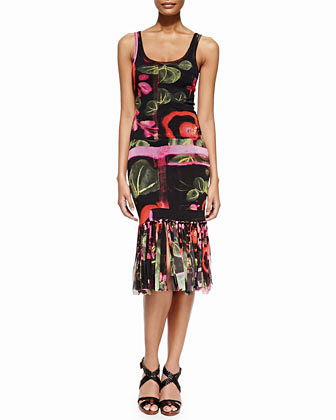 One such email from Bergdorf Goodman caught my eye since it was on the subject of dark florals. While I'm not trying to rush the seasons (I've barely worn any of my light florals yet! 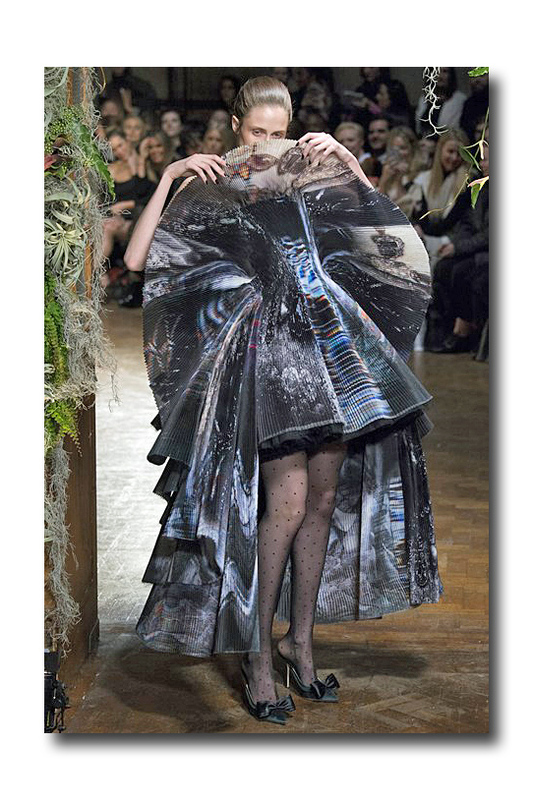 ), I do like the concept of an edgier take on floral and other prints including several dresses by Elie Saab, McQ Alexander McQueen and Jean Paul Gaultier. 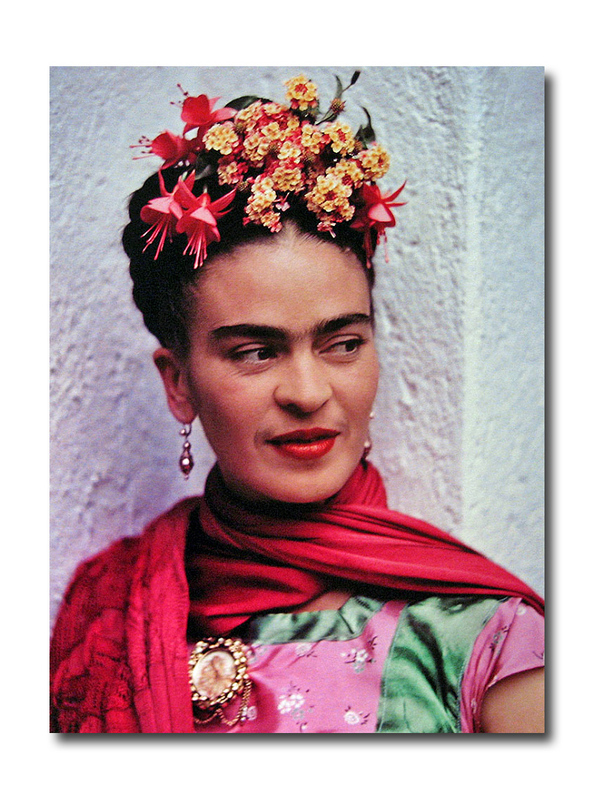 It is suggested that the great love of Frida's life, her husband and fellow painter Diego Rivera (with whom she had a stormy relationship) liked to see her dressed in feminine Mexican style with long flounced skirts, colorful prints all layered together, and signature floral crown. Interestingly, over the course of their marriage they separated a few times which would result in Kahlo cropping her long hair and trading in her frocks for masculine clothing in an act of rebellion. She had favored men's suits and slacks in her youth and actually appeared to be a boy in a family photograph. 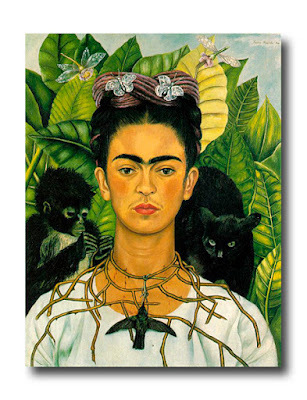 Her now famous self-portraits were a form of expressing not only her creative nature but also her extreme pain and boredom at being bed-ridden for long periods of time while her spine and broken body healed as the result of a terrible traffic accident at the age of 19. 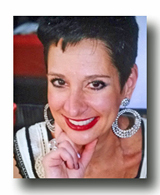 Although she continued to suffer from related medical problems until her death at 47, while she lived she truly celebrated life. 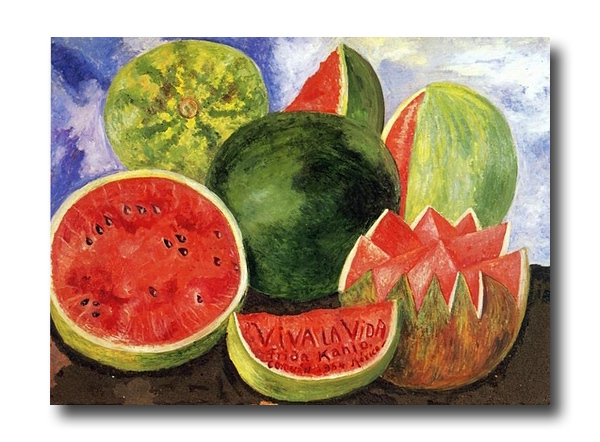 Her last painting was of watermelons and inscribed with the words "Viva La Vida." Though she traveled to Europe and the US fairly extensively, she always reveled in the beauty of her native land. 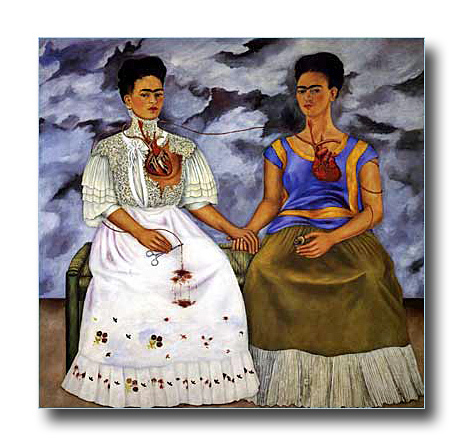 Using her art as a surrealistic mirror to show not only what she looked like on the outside but how she felt on the inside in times of despair gave many of her paintings a visceral feel. During happier times she painted herself with her pet monkeys often in her gardens so we know that gardens were important to her. Using Frida as inspiration, I'm trying to develop more of an interest in gardening at my weekend abode in Westchester. This is in spite of the fact that any indoor plant I've ever tried to raise has historically ended up in the garbage. On a fact finding mission I allowed myself to be dragged to a nursery where my husband enjoys filling up the car with various flowering specimens. Inquiring as to the care and feeding of an especially vibrant rose bush we were given very specific and elaborate instructions. "Wow! That one's high maintenance!" I remarked. The proprietor's response: "Yes, most beautiful things are." Hmmm...it seems that even Mother Nature can benefit from an occasional spa treatment to unearth her true blooming potential. - Máy đưa võng tự động hay thiet bi dua vong tu dong là sản phẩm tinh túy của công nghệ, may ru vong tu dong là món quà tuyệt vời cho những ông bố bà mẹ bận rộn. Nó đang ngày càng trở thành 1 phần của các gia đình Việt nhất là những nhà có trẻ nhỏ hoặc người lớn tuổi. - Hiện nay trên thị trường máy đưa võng tự động có nhiều sản phẩm với nhiều kiểu dáng, màu sắc và giá bán khác nhau làm cho người tiêu dùng phải phân vân khi lựa chọn sản phẩm. 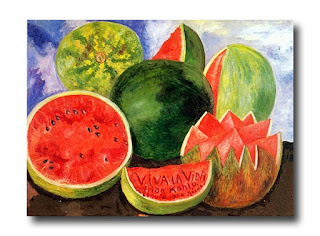 Bất cứ mặt hàng nào cũng vậy, luôn có những “con sâu làm rầu nồi canh” với hàng giả, hàng nhái kém chất lượng với gia may dua vong tu dong siêu rẻ hoặc siêu mắc. Bạn cần chọn lựa kĩ càng may dua vong tu dong chính hãng để được đảm bảo chất lượng, an toàn! - Khi mua các sản phẩm, thiết bị vong tu dong nếu bạn thấy giá bán bất thường, tức quá rẻ hoặc quá mắc thì bạn nên cẩn thận kẻo bị lừa. Với nhãn hiệu uy tín, sản phẩm vong dua tu dong chất lượng và giá bán phải chăng, máy đưa võng tự động An Thái Sơn tự hào là địa chỉ bán máy đưa võng giá rẻ tốt nhất, uy tín nhất cho bé.